Semi permanent makeup reviews vary throughout Dubai and the Middle East. In order to obtain a clear understanding of the level of treatment you will receive prior to literally sitting in the chair is challenging. We recommend to always do your homework and read as many semi permanent makeup reviews as you can and where possible, research the specialist who will perform the treatment. Candice Watson of Exclusive Beauty performs all semi permanent make up and medical micropigmentation treatments to the highest level available in the Middle East. Candice’s skill is unmatched and we pride ourselves in using only the best equipment to ensure the very best treatment. Candice has over 25 years working in the beauty industry and has worked and trained as a semi permanent make up specialist on Harley Street London. Candice moved to Dubai in 2009 to set up Exclusive Beauty and perform Harley Street standard semi permanent make up treatments to the region. When checking Semi Permanent Makeup Reviews, be sure to check the specialist’s health and safety standards. These should always be a major factor in any treatment where blood spores are evident. Exclusive beauty insist that the strictest health and safety standards are followed. All equipment is covered and needles are disposable and are used once per treatment. We have heard stories of people being asked to keep the needles used for their top up procedure. If this happens to you then you are with the wrong ‘specialist’. The correct term is semi permanent make up which uses more refined equipment able to perform ultra fine hair strokes to the delicate areas of the face. Permanent make up should never be totally permanent. Body tattoos are permanent and use cheaper and more aggressive equipment and pigments implanted much deeper into the skin. 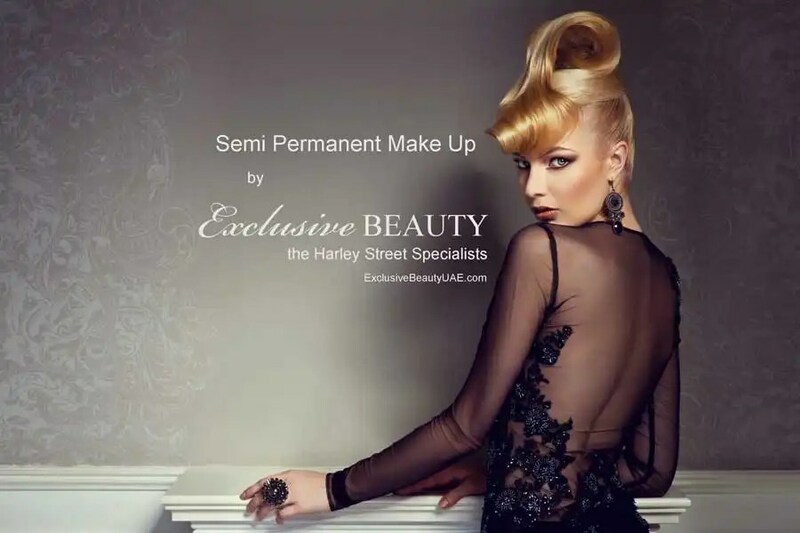 The correct term is semi permanent make up which uses more refined equipment able to perform ultra fine hair strokes at more subtle depths to the delicate areas of the face. Semi permanent pigments are implanted into the upper dermal layer of the skin. Each semi permanent makeup treatment should last 2 or 3 years. This is due to the strength of the sun and UV rays in the region. After 3 years the pigment fades or is expelled naturally from the skin hence the correct term of semi permanent. We recommend a top up treatment every 18 – 24 months to keep the pigment looking fresh. All semi permanent make up treatments should consist of two treatments – one treatment at your consultation and a top up usually 3 – 4 weeks later. Lip colour and blush occasionally require more than 1 top up. Candice Watson of Exclusive Beauty worked and trained on Harley Street, London and is exceptional at semi permanent make up treatments. Candice is also one of the few specialists in the UAE who is qualified to perform medical micropigmentation treatments so you can rest assured her treatments are some of the best in the region. All treatments are performed in the London Centre for Aesthetic Surgury (LCAS) and meet all current Dubai Municipality guidelines. For more information and costs for our range of semi permanent make up treatments please email info@exclusivebeautyuae.com. To make an appointment please call LCAS on 04 375 2393. To discuss Semi Permanent Makeup Reviews or for advice on semi permanent make up treatments including medical micropigmentation treatments please email info@exclusivebeautyuae.com. Semi Permanent Make UP or Permanent Make UP?